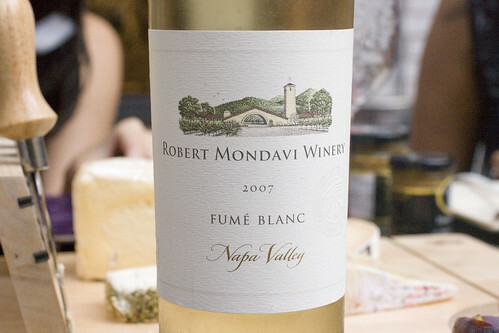 We had a 2007 Robert Mondavi Fume Blanc. Like many of the Robert Mondavi wines I’ve had, this is a perfect safety wine. It’s a great beginner wine as well, being very easy to drink, light and fruity. We had two favorites, with two new one to try. 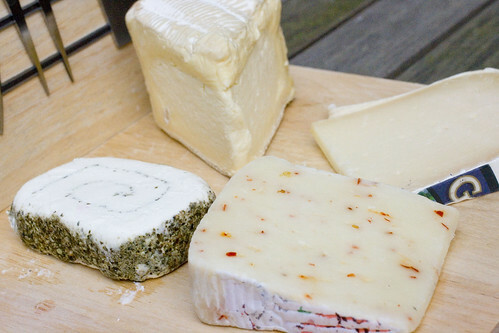 I love Saint Andre (upper left), a super creamy triple cream, with extra cream, cow’s milk cheese. It’s like brie on crack, with the ideal spreading consistency, smoothly coating your tongue. 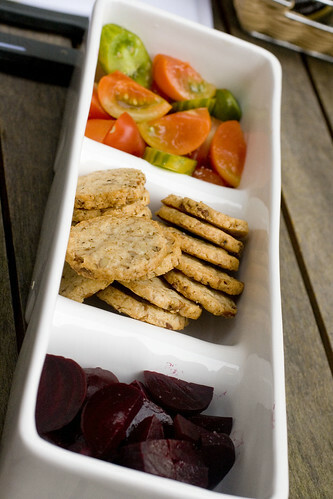 The York Hill Green Pepper & Nutmeg Roule (lower left) is another favorite that my friend Angie often brings. It’s a nice tangy goat cheese rolled with green peppercorn, which adds a nice little kick. It’s also quite pretty. The Lamb Chopper (upper right) was surprisingly good. (Now that I see it’s made by Cypress Grove, I’m not that surprised.) I think of it as a mild sheep version of parmesan, but not as firm. It’s salty but easy to nibble away on. The Rustico Red Pepper (lower right) Sheep’s Milk Cheese was terrible. I imagine it’s similar to what my dog’s chew toys taste like, plastic. We all tried it and then threw it out. Fruit is so easy. The season and availability decides for you. I saw some gorgeous pluots and fresh black mission figs. 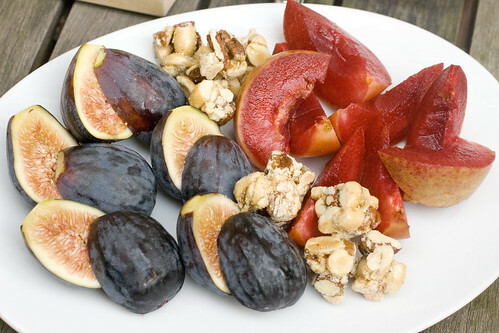 I really loved the way the pink flesh of the fig matched the shocking red of the pluots. I happened to have these pecan almond peanut clusters, which are lightly candied. The olive bar at Whole Foods is fantastic. I’m partial to the green ones that are so crisp, they practically snap back when you bite them. These are the garlic ones and the spicy ones, both delicious. 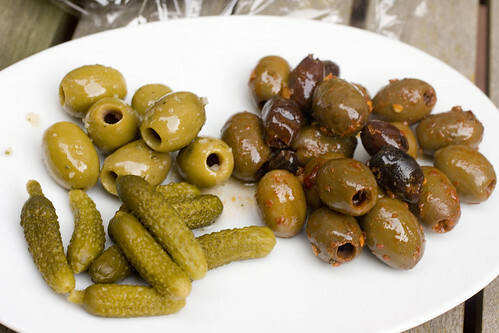 The cornichons here, from Les Trois Petits Cochons, are super tart. 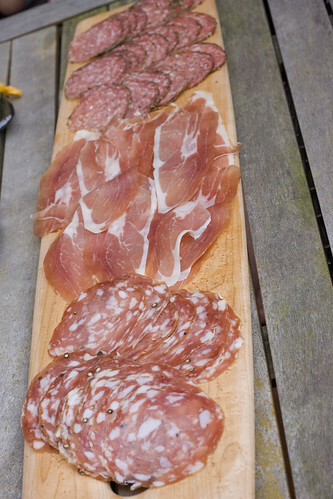 The cured meats are from Whole Foods, an Herbed Salami, Prosciutto (domestic), and I was particularly fond of the Toscano Salame. 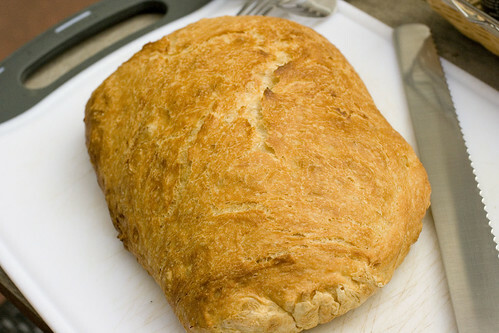 I made the No Knead Bread, which was still warm when we ate it. We also had Cheddar Cheese Crackers (center). We were a bit skimpy on the vegetables this time. Just simple beets and Heirloom tomatoes (technically fruit), both just sprinkled with a little salt and pepper. It was the perfect evening, with a gentle breeze, to sip and nibble the night away. posted by jessica	at 10:28 AM	Filed under Products, Wine. You can follow any responses to this entry through the RSS 2.0 feed. Both comments and pings are currently closed. This looks like the perfect summer party!! I love this idea. Great idea and lots of fun! Love the food variety and of course, the wines!